On Tuesday, Jan. 1, Rep. Keith J. Greiner (R-Upper Leacock) took the oath of office to officially begin representing the 43rd District in the Pennsylvania House of Representatives. Greiner and two other new Lancaster County House members, Reps. Mindy Fee (R-Manheim) and Steven Mentzer (R-Lititz), were sworn in on New Year’s Day. 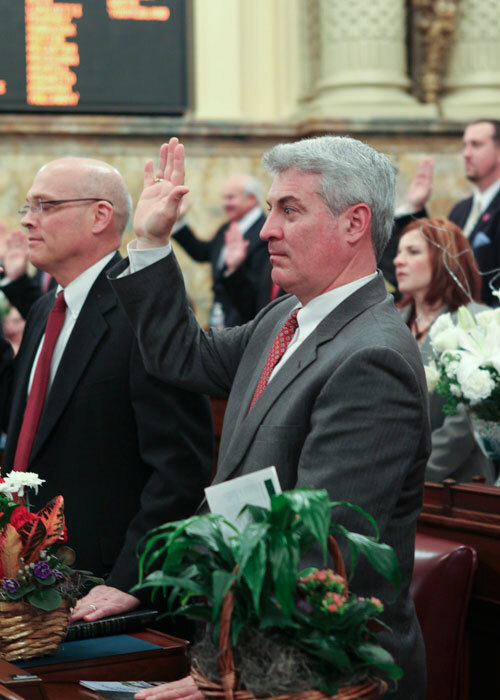 HARRISBURG – Rep. Keith J. Greiner (R-Upper Leacock), a lifelong resident of Lancaster County, today was sworn in to begin his first term representing the citizens of the 43rd District in the Pennsylvania House of Representatives. Prior to his election, Greiner served as the controller of Lancaster County. He also has nearly 25 years of experience in the business world, during which he developed an expertise in auditing, accounting and tax law. Controlling government spending, reducing job-crushing regulations and supporting policies that will lead to job creation are among Greiner’s top priorities. He also will join his colleagues in the Lancaster County Republican delegation as the voice of traditional values in the Legislature. The 43rd Legislative District is comprised of the boroughs of Akron and Millersville, and the townships of West Earl, Upper Leacock, East Lampeter, West Lampeter and Pequea, as well as the 8th precinct of Lancaster Township.